Like Don I had a litter and got all the rest in flights I could as you never know what you are in for when you land. Our FE's would keep me up to date and run interference for me with the flight crew!!! Merry Christmas to one and all. And a Happy New Year!! Happy Birthday Muff and many more!! 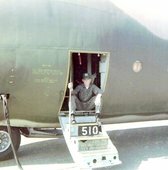 I had never flew on a plane until my flight to Lackland went to Chanute on B-52's sent to Sewart on C- 130E's had to cross train but it was a real trip for me!! I remember Sewart had two or three in the training sq. I am really too old to comment on this but i was on 64 E's for three years ACC CC over 2 years and I just can't think of this kind of one of the problems was with the fuel shut off are oil don't know but we would reach in side and push what we call the primer and she would fire up. Wish I could remember better! Have spent time in the Left seat on long flights the A.C. would want to walk around it was a good feeling that they trust you to say awake. Ha! 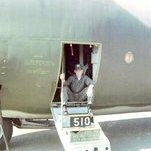 That is my old Bird from Sewart AFB Tenn. Crewed her for about a year and a half she was a real work horse if you don't beleive ask the guys in PRANG.they will tell you. Good luck finding the papers! !